Get a weekly inspirational quote and message to lift your spirits and keep you motivated. Are you unhappy at work? Do you dread Mondays, think about where to bury the boss and feel you've got no way out? Or do you just think that there has to be more to life than this? Then you're probably looking for a change. But you might not know what to do instead, or you might feel that your options are limited because you have a family to care for and a mortgage to pay. 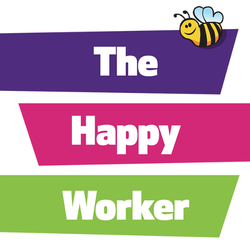 Welcome to The Happy Worker, the place where you can find everything you need to be happy at work. In this book, business and career coach Inge Dowden will give you a step-by-step guide to finding happiness at work. Whether it's a complete career change you're looking for, or just ways to be happier in the job you're in, Inge's tips will guide you along the way. From changing your mindset to updating your CV, the techniques are practical and easy to follow and are guaranteed to improve your life. If you haven't yet bought the book, you can buy it here. You have different options to choose from: you can buy a paperback or Kindle version from Amazon, get an Audio Book, or buy the paperback version directly from the author. The RRP is £15.99 + p&p but different offers will be available at different times. The workbook will really help you take action as it has all the exercises from the book in an easy-to-use A4 format. You'll have everything together and have plenty of space to make notes. Find out exactly what your preferred style is and get your DISC profile done. Remember to get your 25% discount by using the code that's in the book (it's on page 59) and don't forget to enter your email address where you want it sent to. In February 2016, Inge was interviewed about the book for Jobs Radio. You can listen to the full interview here.